3. She has shown remarkable commitment to service. Community service is a central part of her life. She approaches everyone as an equal. She acts on her belief that everyone is entitled to a dignified life. 4. She represents the promise of new Americans. Some say immigrants are a burden to our society, who do not share our values. reflect the dreams and values of Americans who have lived here for generations. Gisele Guerrero walked into HOPE Community Services last year wanting to make a difference. Not wanting to simply donate money, Guerrero thought about what she could do to have a more personal connection to HOPE’s clients. A hairstylist, Guerrero decided to give free haircuts to clients so they could feel better about themselves and look better for potential job interviews. 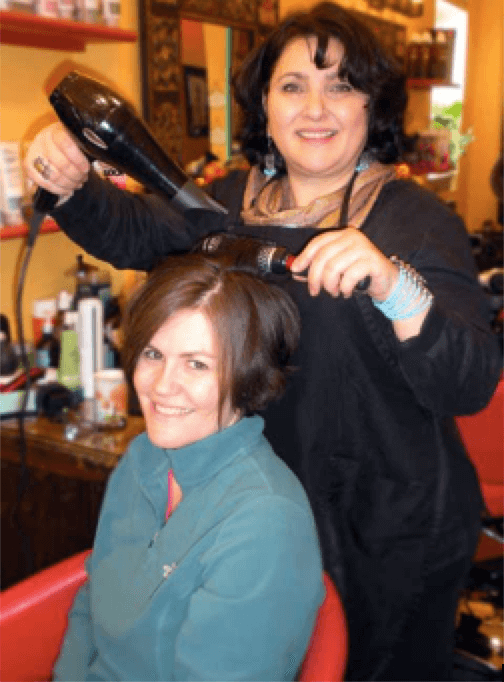 Guerrero, a resident of New Rochelle, has owned Gisele’s Hair Salon in Larchmont for three years after working in the hair cutting industry for over 30 years. When her friend Lillian Brady read a newspaper article about HOPE needing food for their pantry, she decided to send e-mails to her customers while inquiring with HOPE Community Services Executive Director Carole Troum about what the organization needs. She began collecting canned goods, which she dropped off, and went to talk with Troum about what else could be done. Along with her employees Sheila Fernandez and Myra Ochoa, Guerrero gives haircuts at HOPE every two months. When they are giving haircuts, over 30 people show up each time. Along with the haircuts, Guerrero also gives out T-shirts, boxer shorts and two pairs of socks. Guerrero spoke of a man who came in to simply get his head shaved but she noticed that his hair needed to be washed. She did that for him and took the time to style his hair, rather than shave it off. Another man came in with hair down to his shoulders and a long beard. He told Guerrero that he had no money to afford a razor. Guerrero complied as an employee and cleaned the man up. Troum pointed out that this is an important service because most of the clients at HOPE can’t afford to spend their money of haircuts. She added that if a person looks better, their ability to land a job increases. “Gisele is a wonderful, caring, giving human being who understands that there is more to life than making money,” Troum said. Guerrero is in the process of collecting items for the clients at HOPE for her next visit. Items she is collecting include toiletries, shampoo, conditioner, shaving cream, razors, deodorant, toothbrushes and toothpaste. To donate, call Gisele’s Salon at 914-834-1700 or stop by the salon at 141 Larchmont Ave. in Larchmont. Larchmont Salon Owner is Red Cross "Community Hero"
Gisele Guerrero, owner of Gisele’s Salon on Larchmont Avenue, will receive an award for her Good Samaritan work at the ninth annual American Red Cross, Westchester Chapter’s “Community of Heroes” program at the Rye Town Hilton on Thursday, June 17. The program celebrates “ordinary individuals” who “performed extraordinary acts” and have given hope and enhanced the quality of life for their fellow Westchester residents. The Red Cross is honoring Ms. Guerrero for her volunteer work at HOPE (Help Our People Eat) Community Services Center in New Rochelle. 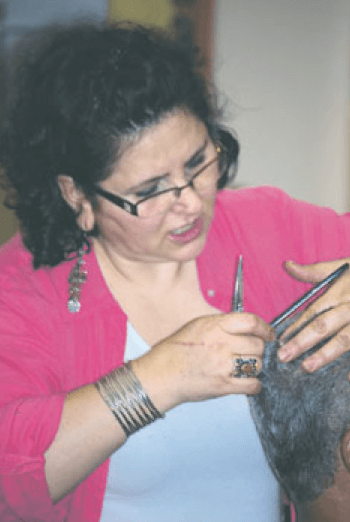 Since April 2009, she has provided free haircuts and a much needed morale boost to clients of the Sound Shore area’s largest food pantry and soup kitchen. From the 26 people at its first session, “Haircuts for Hope” now serves 35-40 men, women and children from New Rochelle, Mamaroneck and Mount Vernon. As follow-up to a one-time food drive to deliver canned goods, rice, diapers and monetary donations to the Center, “Haircuts for Hope” has grown to include “goody bags” donated by salon clients for everyone who comes for a haircut. Depending on need, the bags contain shampoo, conditioner, pads, toothpaste, tooth brushes, deodorant, razors, shaving cream, lotion, soap, Q-tips, diapers, Desitin ointment, baby shampoo and lotion, Tylenol, and formula. During the December holidays, “Haircuts for Hope” also provided Stop and Shop $20 gift cards, thanks to a generous gift from Hector Mena. Continued... Larchmont Salon Owner is Red Cross "Community Hero"
Gisele Guerrero provides free hair cuts at HOPE. When she decided to offer her services to the men, single mothers with small children, disabled, handicapped, unemployed and elderly people at the Center, Ms. Guerrero had no examples to follow. She had no budget or hands-on experience working with people who could not afford to have their hair washed or cut. She was busy facing the demands of her own young hair salon in the midst of a sharply contracted economy. But to accept hair care as an unobtainable luxury for the needy at the Center, was unthinkable. Ms. Guerrero’s “can-do” attitude and commitment to help the less fortunate led her to create a support network based on simple gifts of time, service, personal care items and funds. She proved that even in a paralyzing recession, neighbors can reach out and mobilize limited resources on a shoestring budget to deliver much needed help to the invisible poor. Grateful recipients call Ms. Guerrero and her stylists “blessings”, “angels from heaven”, and “protectors sent by God.” They are thankful to be able to look and feel better about themselves, enjoy moments of dignity and fun in such hard personal times, and look more presentable for job interviews. Carol Troum, Director of HOPE Community Services, describes “Haircuts for Hope” as “a wonderful thing for our clients who don’t have access to haircuts or other things that make them feel good about themselves. Ms. Guerrero treats them with incredible dignity and makes it such fun.” Some people even ask Ms. Guerrero and her stylists for help finding jobs. Gisele Guerrero in her Larchmont Avenue salon. Ms. Guerrero hatched the idea for “Haircuts for Hope” with early team members Lillian Brady, a business consultant, and salon stylists Sheila Fernandes, Mayra Ochoa, and Ana Rivera. Soon her community service team expanded to include stylists Michelle Giordano and Gaylene Goss, Skylar Baker, various salon clients, and Gisele’s daughter Priscilla Guerrero and granddaughter Soleil. Ms. Guerrero is especially grateful for generous contributions from L’Oreal, USA, and Reverend Herron-Piazza’s 9th grade confirmation class at St. John’s Episcopal Church in Larchmont. 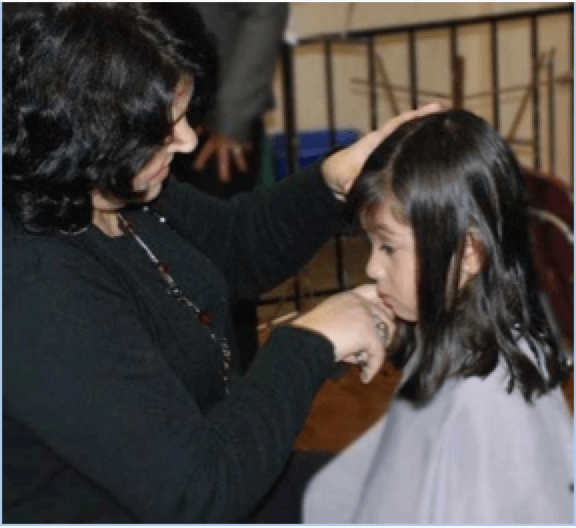 “Haircuts for Hope” is not the first time Ms. Guerrero has embraced community service projects. After Hurricane Katrina hit, she donated proceeds from haircuts to the American Red Cross Katrina relief fund. She has given haircuts to women and children at the My Sister’s Place shelter, and offered workshops to graduates of the shelter. And for years at Thanksgiving and Christmas, Ms. Guerrero has provided free turkeys and other holiday fixings to the needy with supermarket receipt coupons donated by her clients. Since 2008, when Gisele’s Salon opened, she has spearheaded broader communal efforts involving colleagues and clients at the salon. That year Ms. Guerrero collected $4,300 in less than six weeks, in a salon-based fundraiser for the Children’s Hope Chest of Westchester (a non-profit organization that helps children and families in crisis). In collaboration with the Junior League, salon stylists also provided cosmetic “makeovers” for recipients of help from the local Hispanic Resource Center. This year after earthquakes devastated Haiti, Gisele’s Salon sponsored a one-day “cut-a-thon” on March 7th which raised over $2,600 for “Midwives for Haiti” (a non-profit organization that sends certified nurse midwives to Haiti to teach essential skills to traditional birth attendants). People often find it difficult to say ”no” to Ms. Guerrero when she asks for community support, because such giving helps solve a problem that they could never fix by themselves. It doesn’t hurt, either, that Ms. Guerrero’s fundraising sometimes involves raffles of goods and services donated by simpatico Larchmont merchants. When a community stands together like this, there is much to be gained on many levels. To find out more about American Red Cross “Community of Heroes” awards, or to purchase tickets to the award program on June 17 (which is open to the public), contact Tricia@HRGinc.net or check westchestercounty.redcross.org.